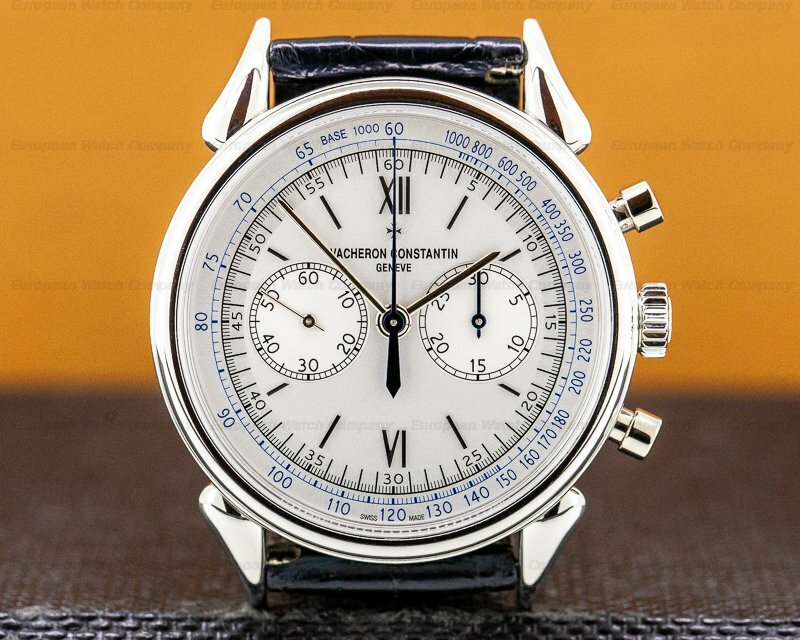 30021 Vacheron Constantin 47112/000p-8915 Malte Perpetual Calendar Chronograph, 47112000p8915, 47112, platinum stepped case with sharp stepped lugs on a strap with a platinum tang buckle, manual wind Vacheron Constantin caliber, 30 minute chronograph, day, date, month, leap year indicator, moon phase, silver dial with applied white gold indexes, sward hands, red accents, half hunter case back shows the movement, sapphire crystal, size 39mm, thickness 14mm, Like New with original box and papers dated 5 / 2001. 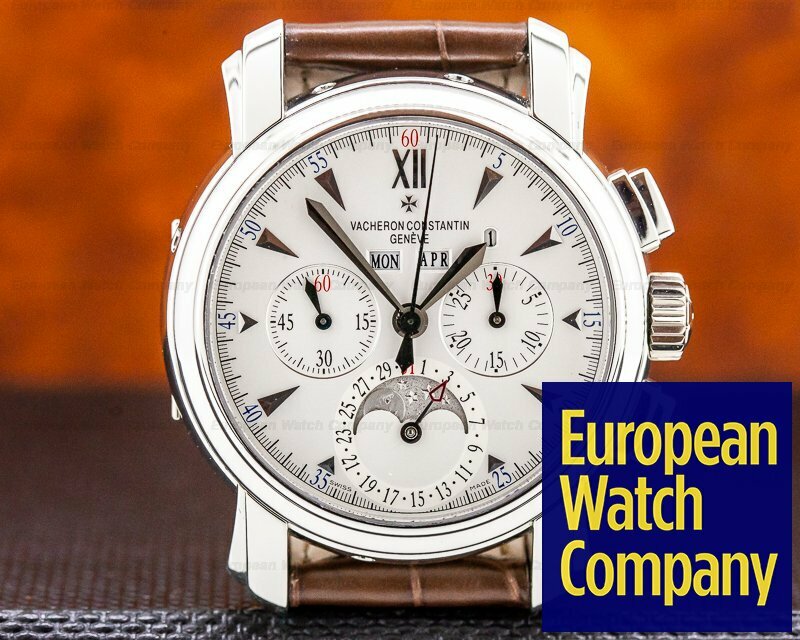 This is a platinum Vacheron Constantin Malte Perpetual Calendar Chronograph 47112/000p-8915. 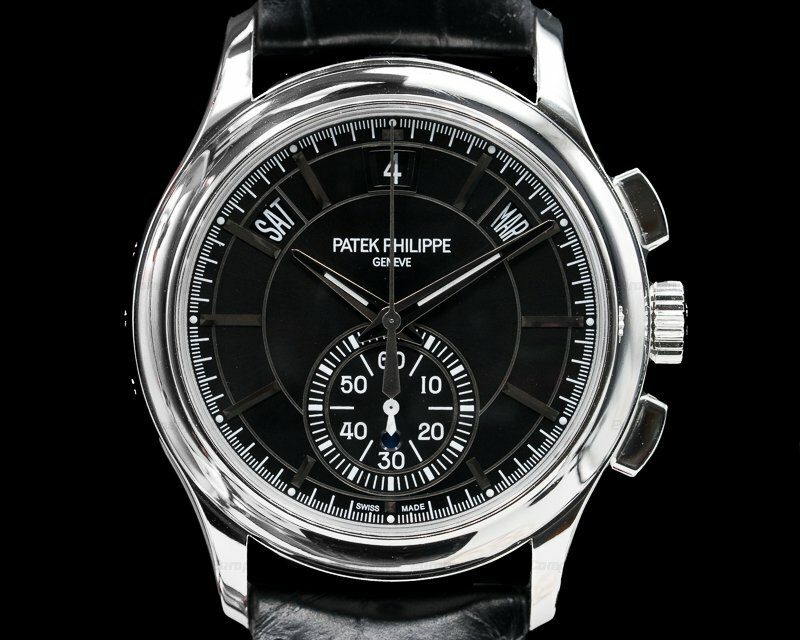 It has an alligator leather strap with a platinum Vacheron Malte tang buckle, and a scratch resistant sapphire crystal. 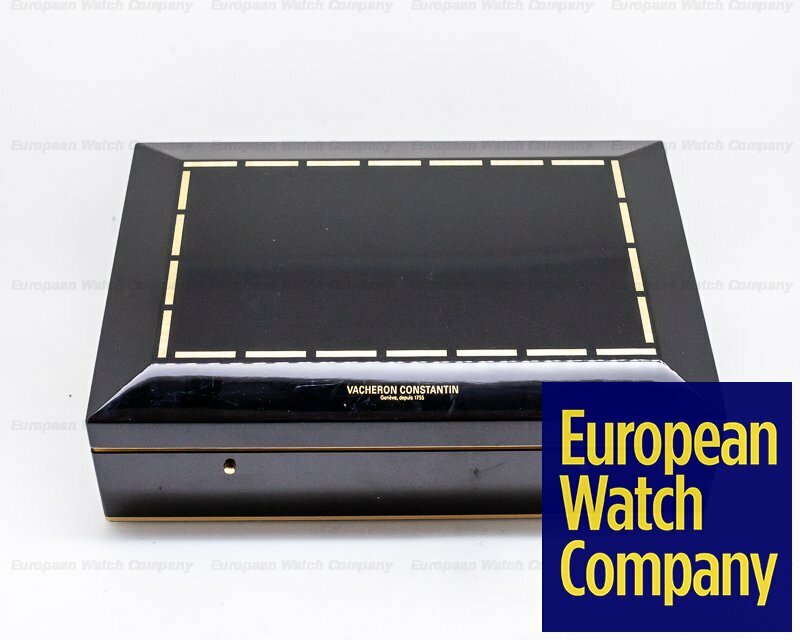 It has rectangular chronograph pushbuttons and an over-sized winding crown, and there is a corrector on the left side case band at 10 o'clock for the date. 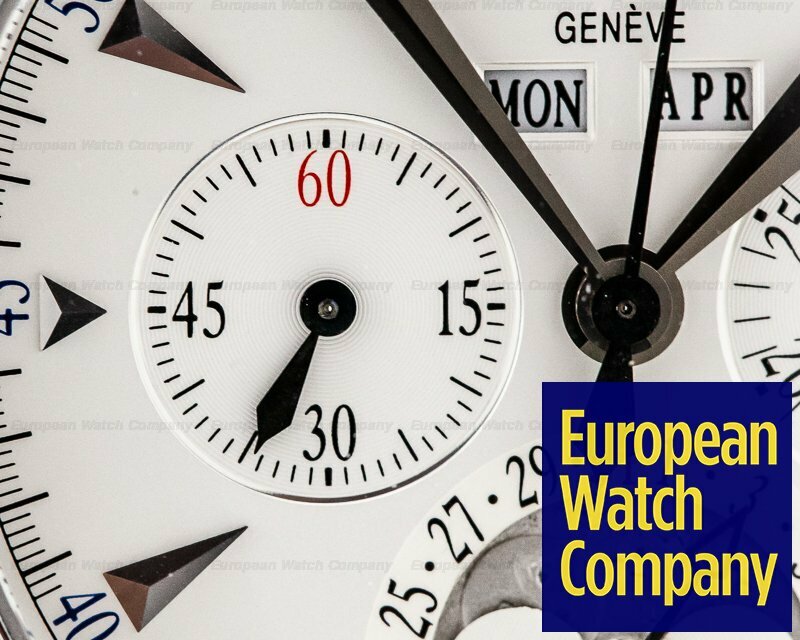 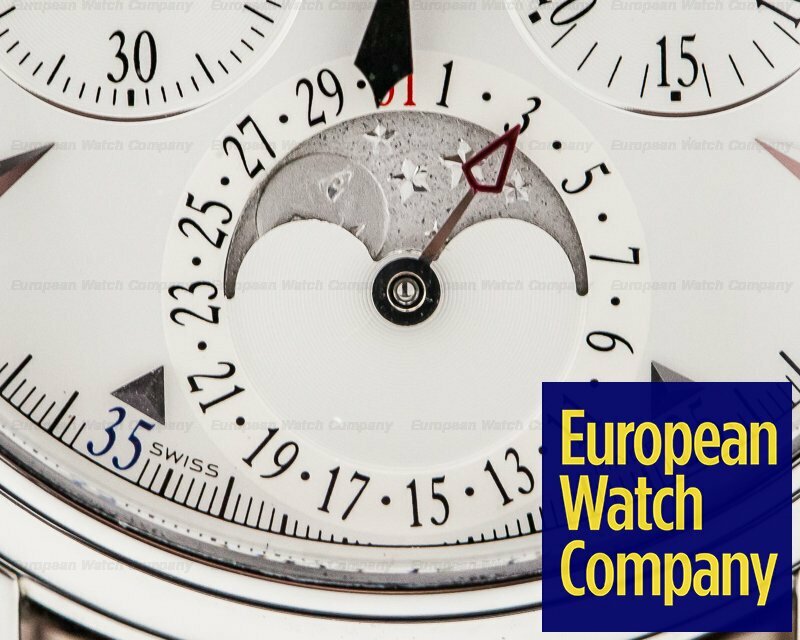 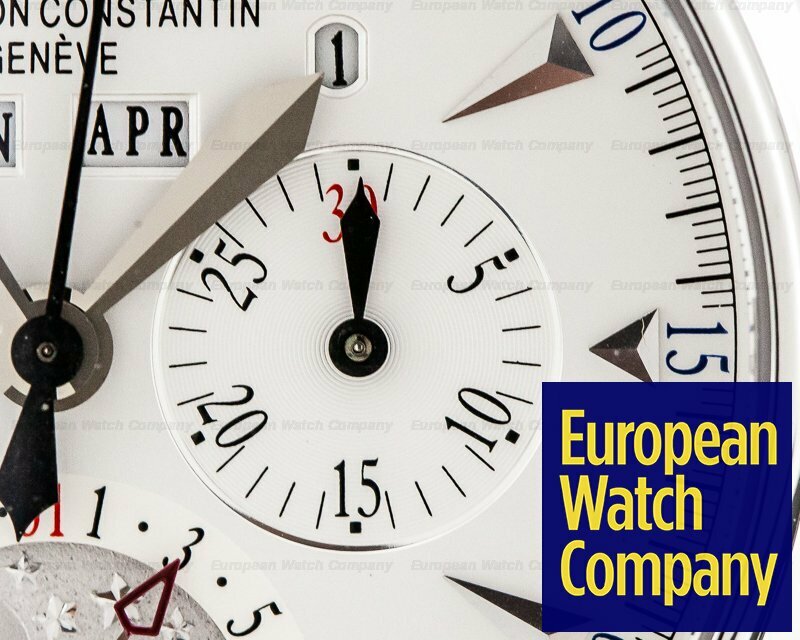 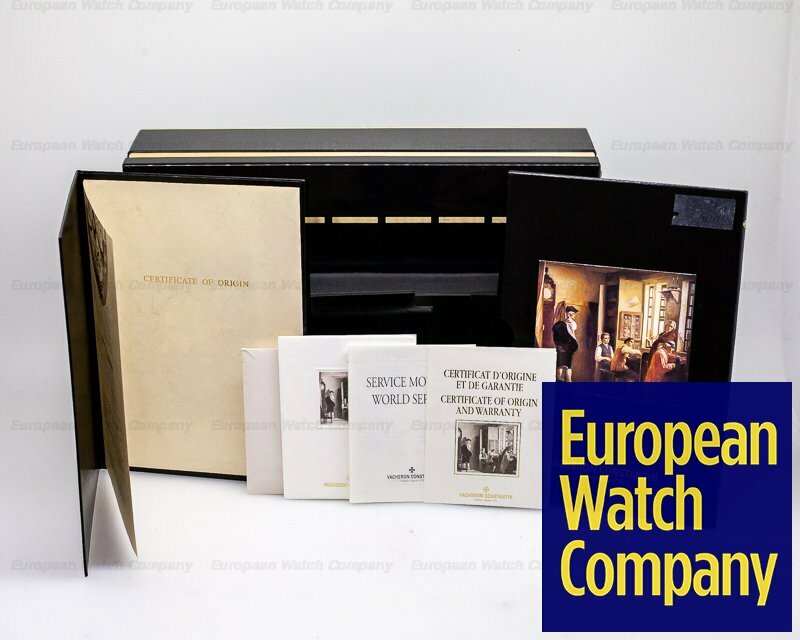 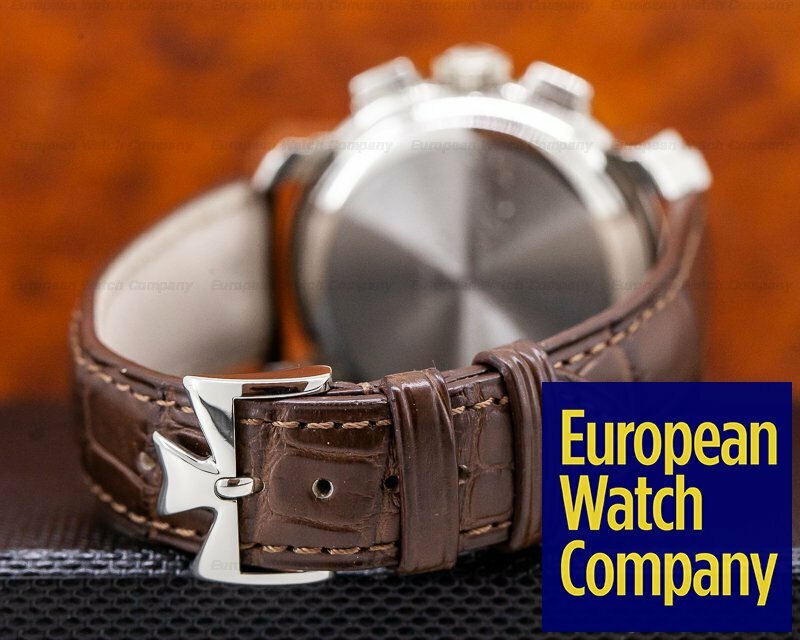 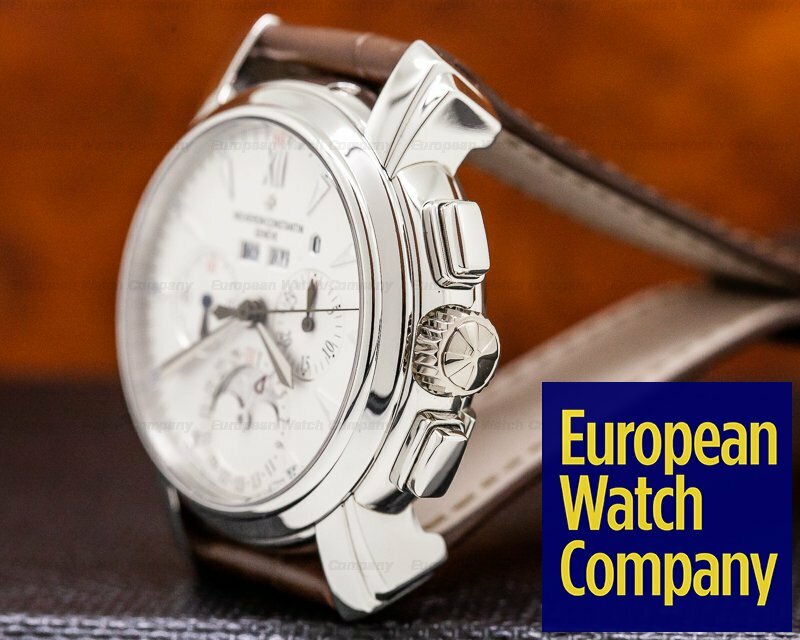 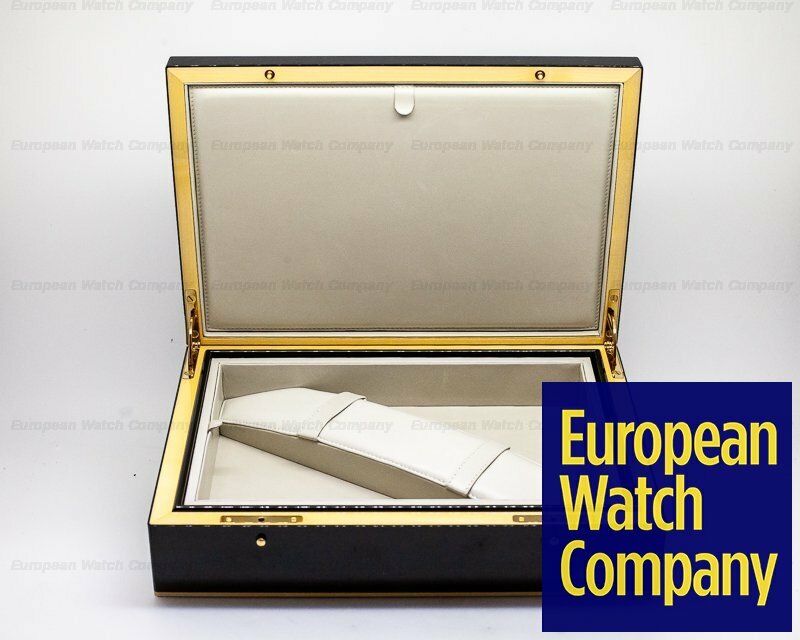 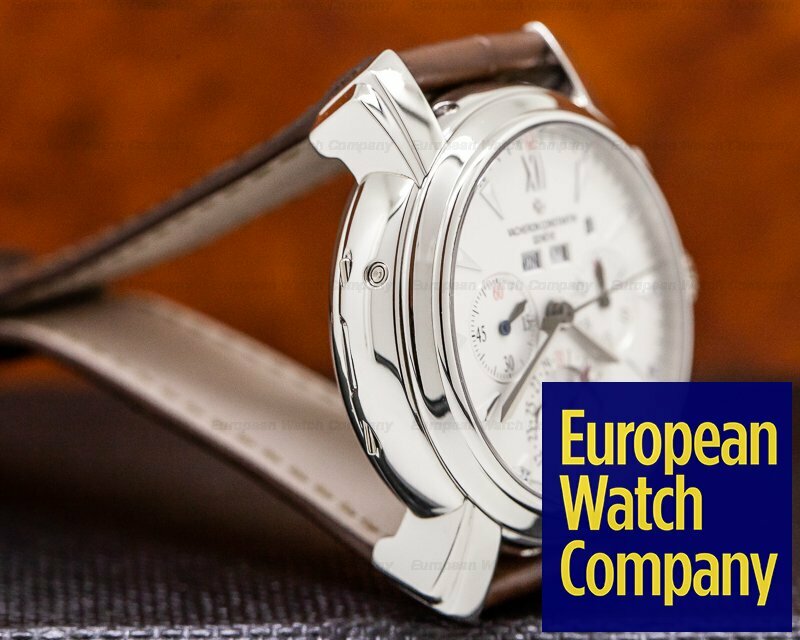 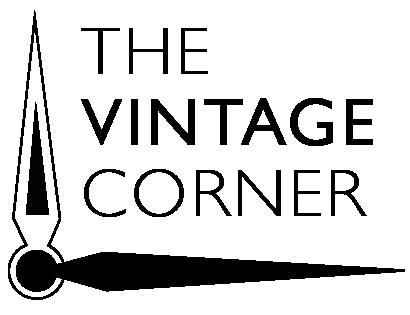 There is a solid brushed hinged half-hunter case back cover that is engraved with "VACHERON CONSTANTIN – GENEVE;" it reveals an exhibition sapphire display case back secured with 4 screws that's engraved, "VACHERON CONSTANTIN – 47112," a serial number and various hallmarks. 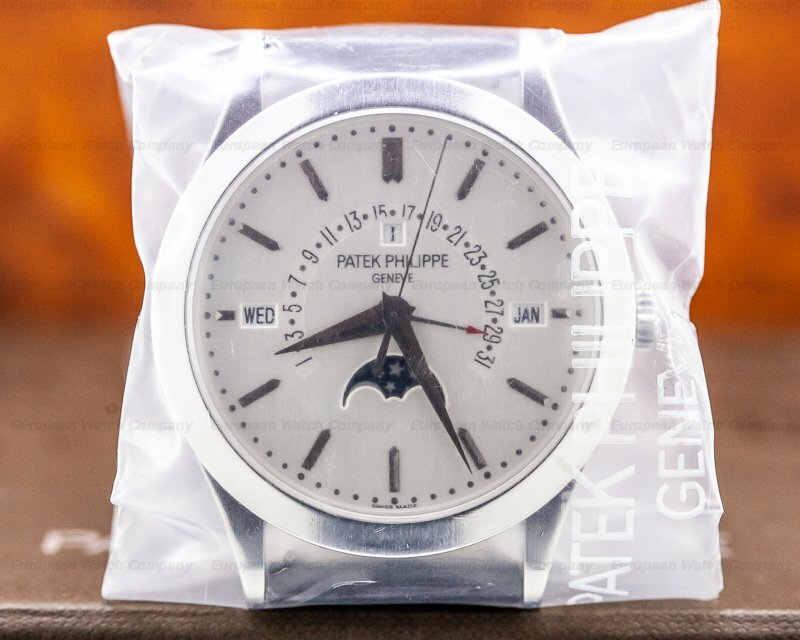 The 39mm diameter solid three-body case, fancy fluted lugs, and angled stepped bezel are polished. 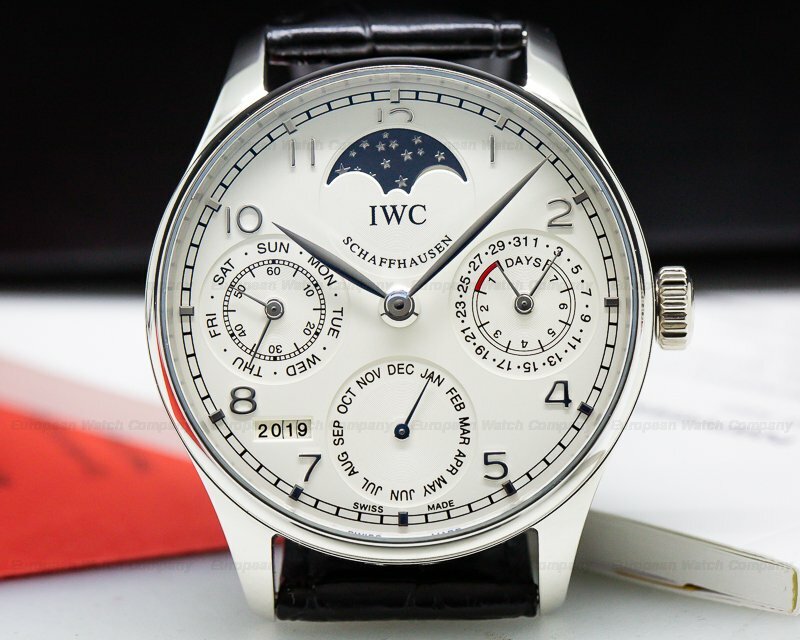 The dial is silver with red accents, applied white gold faceted dart hour markers, a Roman numeral at 12 o'clock, white gold sword hands, and a center sweep chronograph hand. 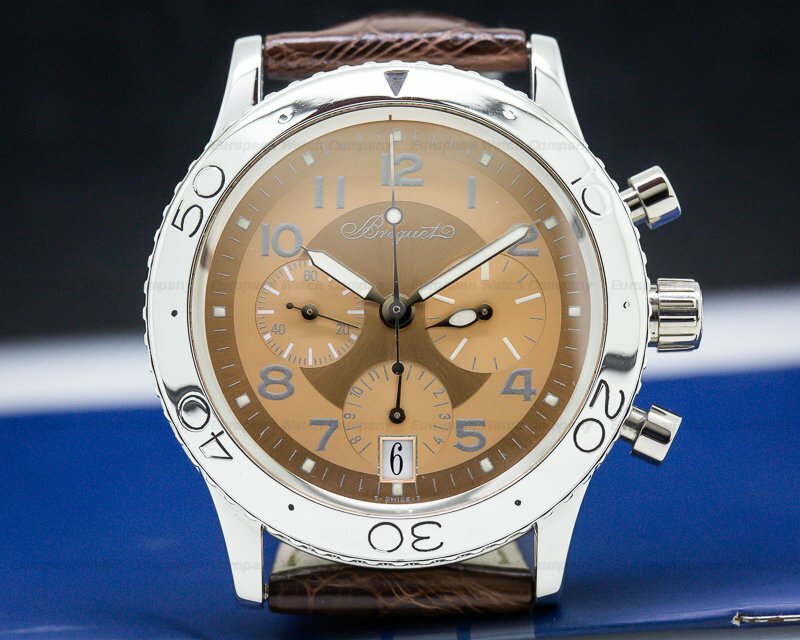 It has a perimeter 60-minute/one-fifth second scale with Arabic numerals every five minutes. 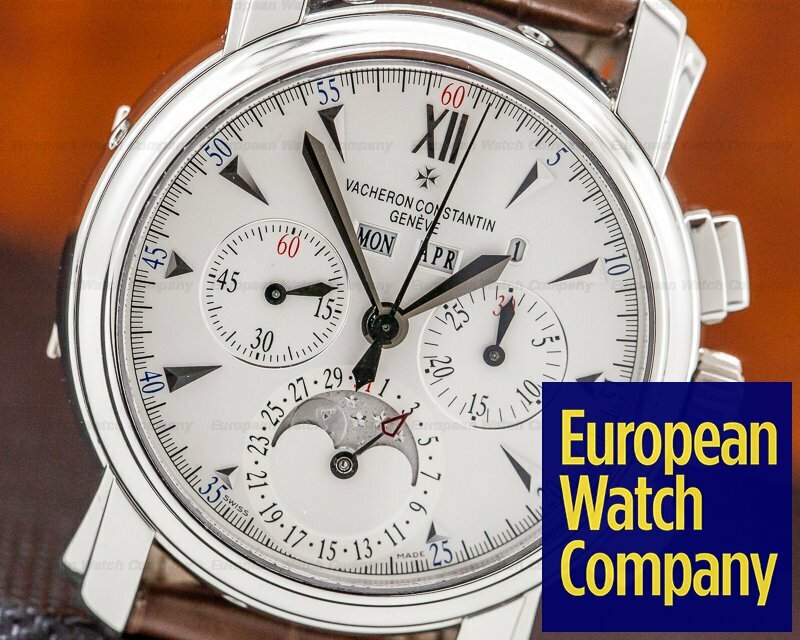 It has twin rectangular aperture windows underneath the 12 o'clock position for the day and the month. 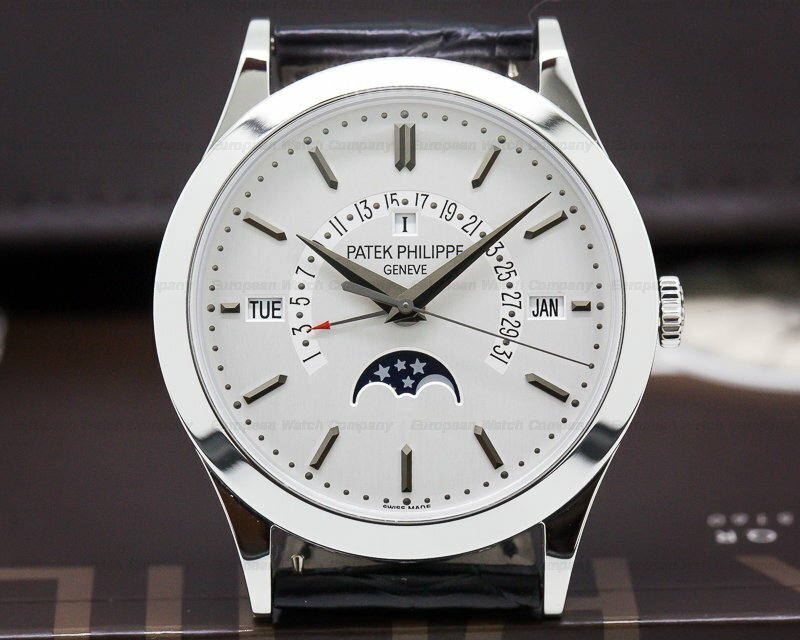 There are three recessed subsidiary dials, including a running seconds indicator at 9 o'clock, a 30-minute totalizer at 3 o'clock, and there is a moon phase and radial date dial at 6 o'clock. 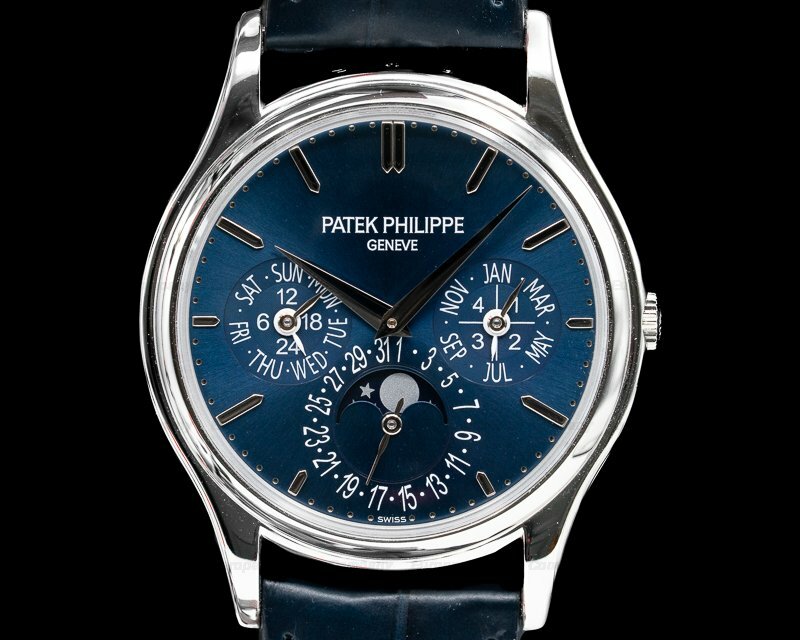 There is a leap year aperture between 1 and 2 o'clock, and it has a 48-hour power reserve at full wind. 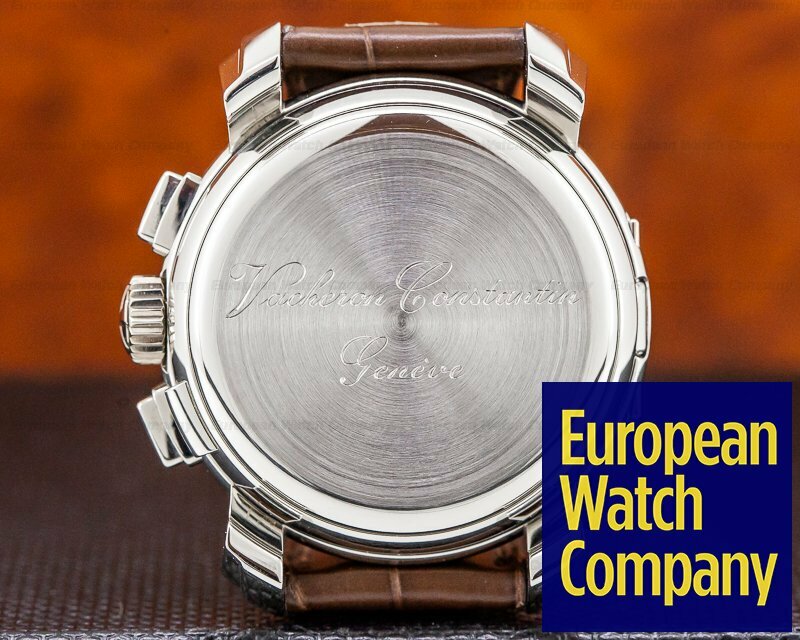 It's water resistant to 30 meters/100 feet, and the 14mm thick case, dial, and movement are all signed. 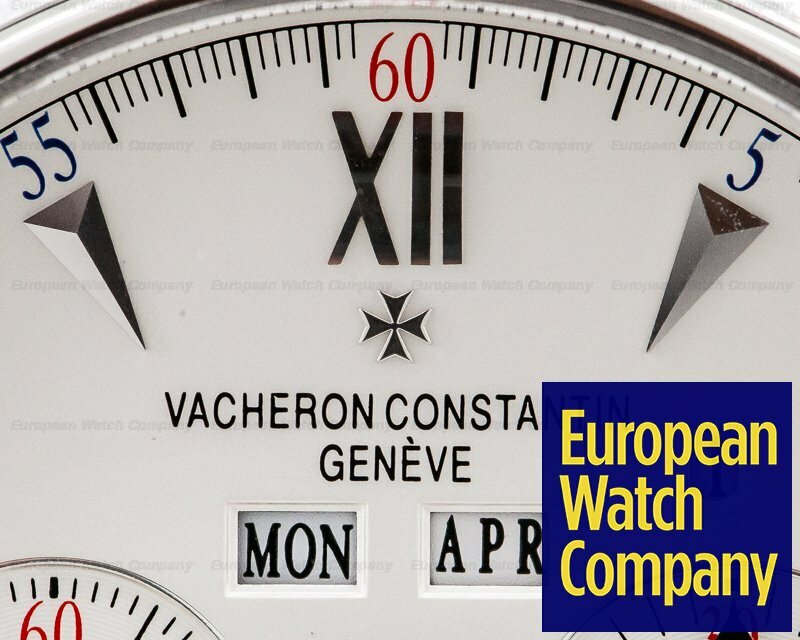 This Vacheron Constantin Malte Perpetual Calendar Chronograph 47112/000p-8915 has a mechanical manual winding Vacheron Constantin caliber 1141 QP movement. 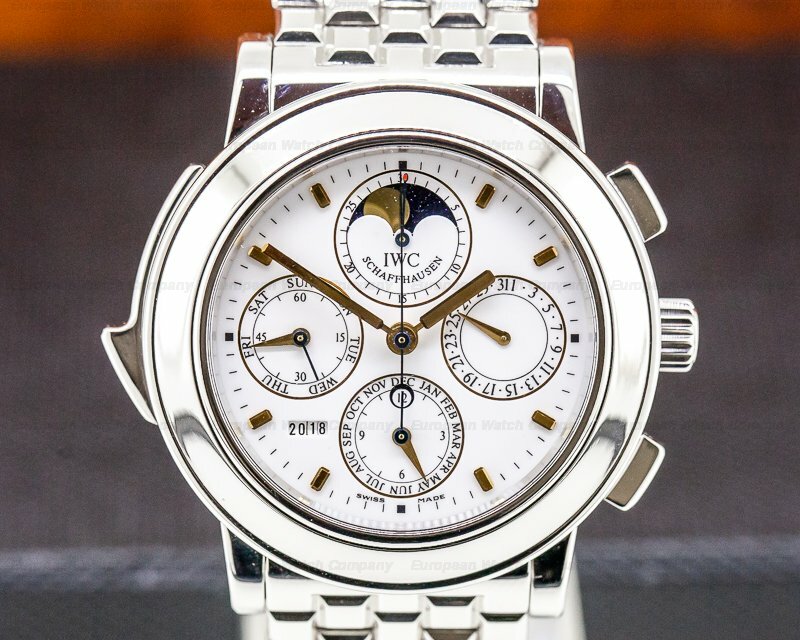 It's rhodium-plated, with fausses-côtes embellishment. 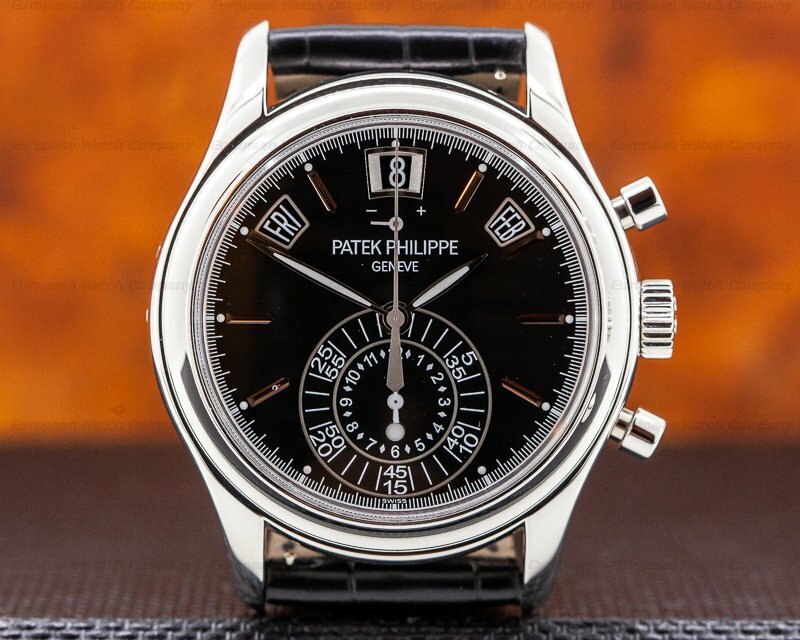 It's constructed with 21 jewels, a shock absorber device, and a straight-line lever escapement. 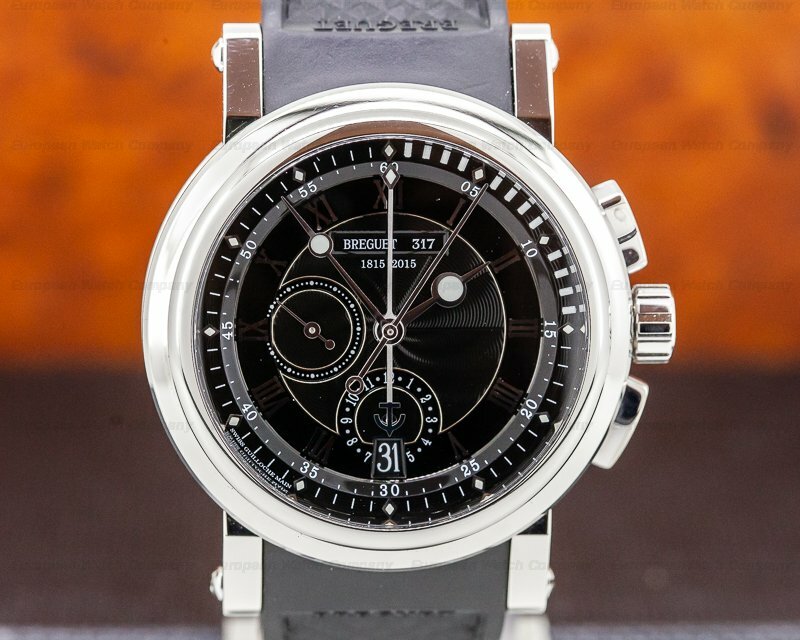 It includes a monometallic balance that's adjusted to 5 positions, a self-compensating Breguet balance-spring, and a micrometer regulator.